Mayra’s journey as a Community Support Worker (CSW) with Bethlehem Housing and Support Services began three years ago after graduating from the Social Service Worker program at Niagara College. She is one of our team of eight Community Support Workers that provides support services to individuals and families living at Bethlehem Housing or within the community on an outreach basis. 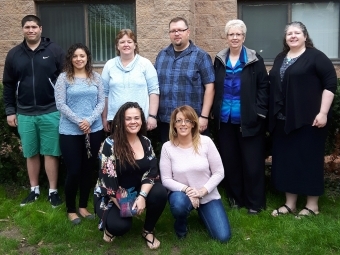 The CSW’s are an essential part of what makes our organization so successful in helping people overcome their issues related to homelessness, family breakdown, domestic violence, physical disability, and mental health. Every day Mayra walks alongside her clients by providing advocacy and support. When supporting clients that are dealing with domestic violence she assists with safety concerns, ensuring the well-being of children, and addressing physical and mental wellness. When supporting clients that are facing homelessness she often learns about histories of childhood trauma or abuse, even though initially a client may only be seeking assistance with housing. “It is important for me to respect my client’s boundaries and let them choose what they want to share. In many cases they end up opening up about their past, which helps them to move forward.” Mayra works with the client and the issues they are facing in a way that will make them feel comfortable. While the role of a CSW can bring on its fair share of challenges, for Mayra, it’s important to focus on the rewarding moments. One of her most memorable clients was several years her senior. When they first met, the client was quite apprehensive about their age difference and was unsure if Mayra would be able to relate. She was homeless, battled with addictions, and had mental health issues. She had just finished an addiction treatment program when she came to Bethlehem Place.